Since the beginning of October, the S&P 500 index lost more than 1.0% but remains in a bullish phase since early May. On yesterday’s session, the US index initially fell with a wide range but found enough support to trim most of its losses and managed to close near the high of the day, however, closed within Friday’s range, which suggests being slightly on the bullish side of neutral. The stochastic is showing a strong bearish momentum and crossed below the 50 midline. 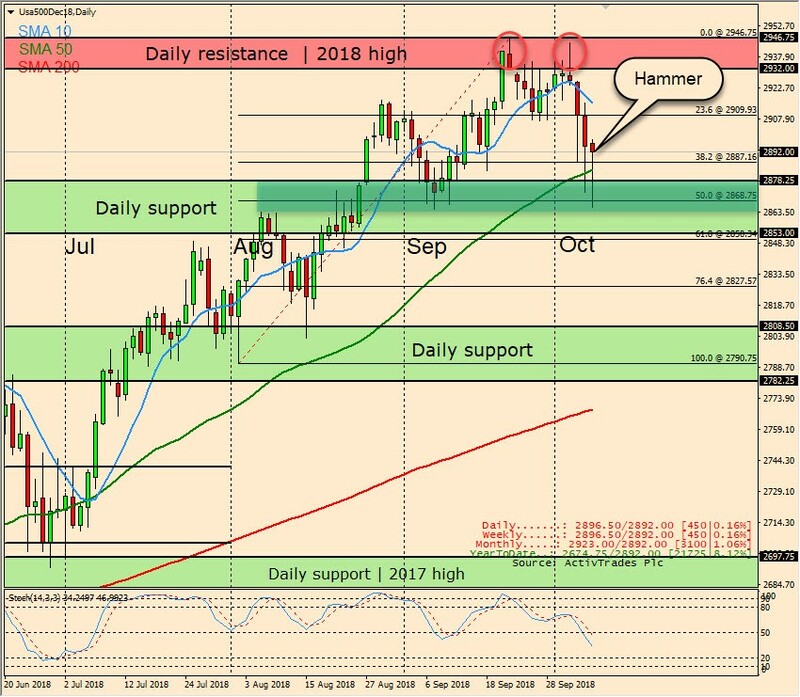 After a failed attempt to reach the year-to-date high at 2,945.75 made in late September, the S&P 500 began a downward correction, however, it seems to have found sufficient support around the 50 Fibonacci retracements to halt the downward move and even to bounce it back up creating a hammer pattern. The hammer is an extremely helpful candlestick pattern to help traders visually see where support and demand are located and can signal to traders that the downtrend could be over.